I re-rooted and re installed a custom ROM on my HTC hero last weekend, but things were not working out the way they should. Custom recovery was not booting, all that I was getting was a 'Red triangle with exclamation mark' and I was stuck at it. So if you're facing the same issues with your mobile while installing a custom ROM on it; then read on the following post on how to make things work and install a custom android ROM on your device. 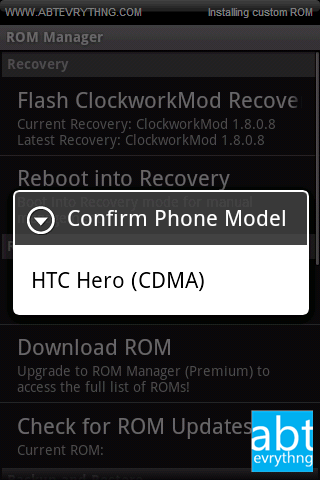 Presented in two posts is a complete way to root and install a custom ROM onto your HTC Hero. I love HTC's Sense interface and didn't wanted to leave it so I installed SalsaSense ROM on it. It is a Android 2.3.3 ROM for HTC hero with HTC sense. 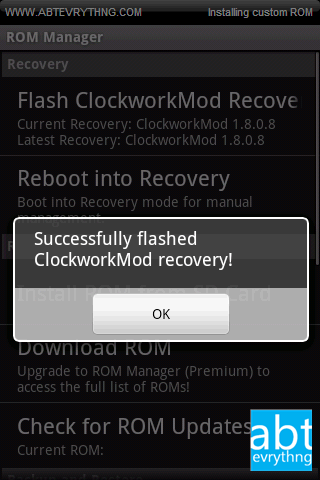 I am using this rom but you can use any other ROM you want using the method mentioned below. In order to install a custom ROM you first need root access on your mobile. Root access means access to read-only files and folders on your android systems. Unlike any other methods you must have read about rooting, the rooting process I am talking about is pretty simple. You just need to download and install and app and then it will root your android at the click of a button. For rooting your android device follow the rooting process given at Access and download us and other market apps on your android. Remember that in Step 4 uncheck 'Soft Root' option and then click root. so that you have full control of the phone which is required for installing another rom. Recovery is actually a program that allows you to make modifications to your device. Using recovery images you can backup and restore your existing system. In this steps too there are no technicalities involved. 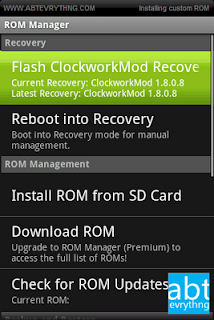 Open Android Market, search for 'Rom Manager' and download the ROM manager application which is the first result. Now follow these steps in exact same order in order to save yourself from getting an error screen (with exclamation mark) on reboot. Please note that in order to successfully install custom ROM, please connect your mobile to internet using WI-FI (or 3G data) as far as possible. This is because we will be downloading data going forward. 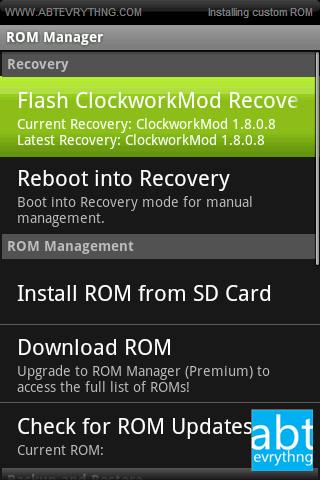 Open Rom Manager, click Menu button and tap on 'Settings'. 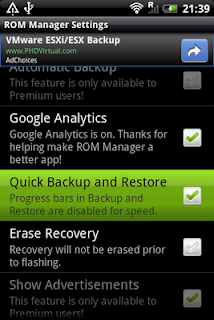 In the ROM Manager settings screen, check the option Quick backup and restore. Hit back button to save the settings and get back to the ROM manager main screen. 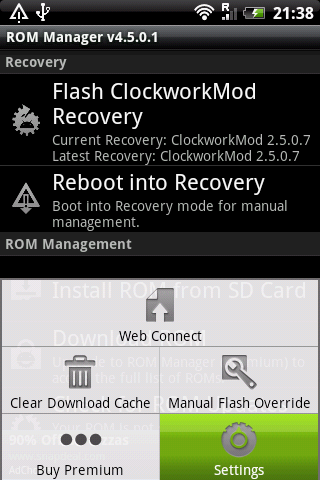 Now tap on the first option, that is Flash ClockworkMod Recovery. As soon as you tap you will see the bar on the top with application name will change to download progress bar. You'll get a prompt for confirming your device, just click on it to continue. The mobile will now download the recovery image. After the download gets finished you'll get a notification displaying 'Successfully installed ClockworkMod Recovery'. Click OK to continue. You'll be back on main screen now. 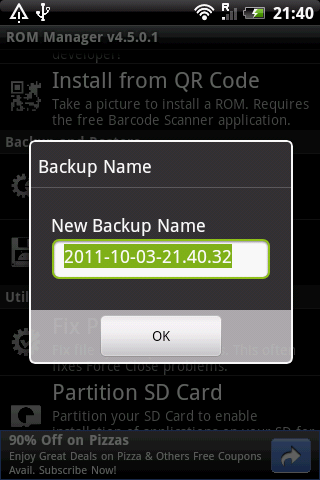 Scroll down to the backup and restore category and tap on the option 'Backup current rom'. System will then prompt you to choose a name for this backup, type the name you want and tap ok to continue. You'll now get a second prompt saying that your phone will reboot into recovery form making backup, just tap okay. After this you'll see your phone booting up but a little different this time. Stay back and relax, the system boots into recovery and saves the existing states of the phone. You can also see the progress on the screen. In 15-20 minutes the process will finish and your phone will boot up again. Now it will boot up normally. Congratulations! You just rooted your phone and made a backup of your current system. 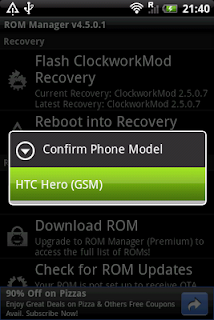 Stay tuned, In the Part 2 of this article we will continue with custom ROM installation onto your htc hero.